Even if you follow all the recommendations for secure computing, your hard drive can still die –mine did last December. It took four days to reinstall all my programs – and despite an online backup program, I still lost files. Now, I’m a backup maniac. Here’s what I learned from the experts. Removable Storage Weekly, copy all your documents to DVDs, a memory stick, flash drive, CDs or disks and keep them off-site. Think all this is expensive and time-consuming? Try recovering your files after your hard drive dies. One data restore company quoted me $2,500 for their seven-day-turnaround plan. Ouch! Centralize Data Just because it’s “data” doesn’t mean it’s centrally stored. I learned the hard way that interview recordings, creative output, and submission tracking information may be “hidden” within their own programs. Ditto bookmarks, mail archives, and digital pen files. Put all your irreplaceable information in one directory for easy saving. Full System Backup Since it was so time-consuming to reinstall all my programs, I invested in software (Norton Ghost) that creates a complete clone of my computer’s entire contents. Second Computer To avoid any loss of productivity, once a week I copy my whole hard drive to my laptop. 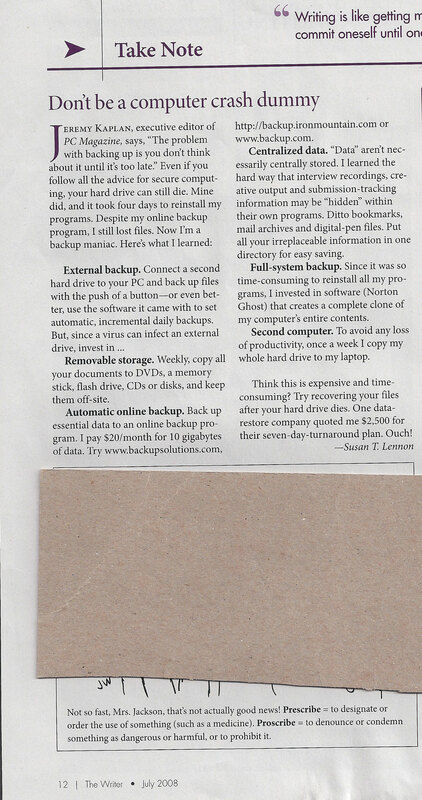 “The problem with backing up is you don’t think about it until it’s too late.” --Jeremy Kaplan, Executive Editor, PC Magazine.